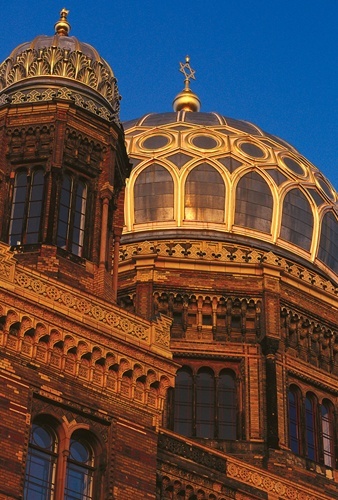 The Neue Synagoge ("New Synagogue") was built 1859–1866 as the main synagogue of the Berlin Jewish community, on Oranienburger Straße. Because of its splendid eastern Moorish style and resemblance to the Alhambra, it is an important architectural monument of the second half of the 19th century in Berlin. The building was designed by Eduard Knoblauch. Following Knoblauch's succumbing to illness, Friedrich August Stüler took responsibility for the majority of its construction as well as for its interior arrangement and design. It was inaugurated in the presence of Count Otto von Bismarck, then Minister President of Prussia, in 1866. One of the few synagogues to survive Kristallnacht, it was badly damaged prior to and during World War II and subsequently much was demolished; the present building on the site is a reconstruction of the ruined street frontage with its entrance, dome and towers, and only a few rooms behind. It is truncated before the point where the main hall of the synagogue began.